Massages are a practice of ancient derivation that comes in a lot of ways depending on the origin of the technique, which develops a potential energy through the hands and brings benefits to the well-being and personal sphere, both physical and mental. SWEDISH MASSAGE: superficial muscle relaxant, which promotes the recovery of energy and relieves muscle tension (60 min.). RELAXING MASSAGE: allows the release of contractures and localized pain due to pressure and specific manual treatment (60 min.). LINFODRENAGGIO Vodder method: fights cellulite, reduces the lymphatic stasis and heaviness due to water retention (60 min.). MASSAGE Lomi Lomi Nui Hawaiian: thanks to the practice of slow movements helps to drain fluids and to give a feeling of lightness and general well-being (60 min.). SPORTS MASSAGE: ideal to promote the absorption of lactic acid and restore muscle tone (60 min.). MASSAGE MAORI: registered trademark Diabase, performed with wooden tools which can generate deep myofascial stretching but , at the same time, they relax and restore muscle tone. 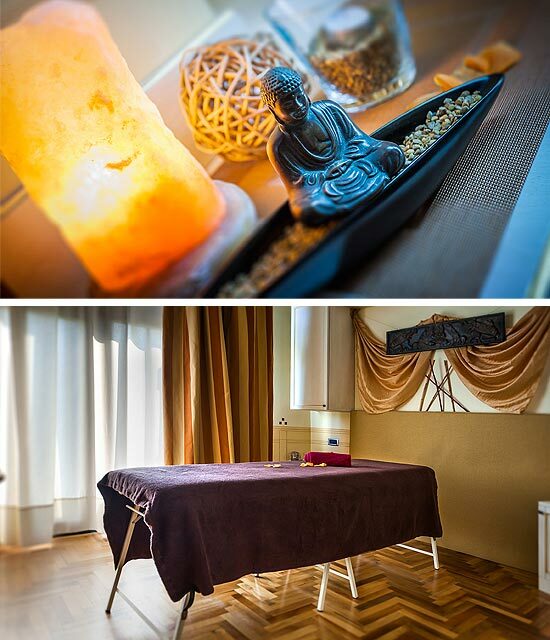 All treatments are carried out with the exclusive use of natural products, such as sesame oil, coconut oil, essential oils, spices, green or white clay, natural incense without chemical fragrances.